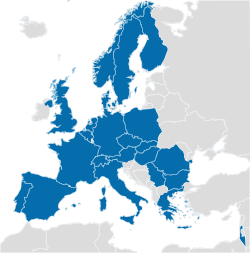 The European Organization for Nuclear Research (French: Organisation européenne pour la recherche nucléaire), kent as CERN (French pronunciation: ​[sɛʁn]; derived frae the name "Conseil Européen pour la Recherche Nucléaire"), is a European research organisation that operates the lairgest pairticle pheesics laboratory in the warld. Established in 1954, the organisation is based in a northwast suburb o Geneva on the Franco–Swiss border, (46°14′3″N 6°3′19″E﻿ / ﻿46.23417°N 6.05528°E﻿ / 46.23417; 6.05528) an haes 22 member states. Israel is the anly non-European kintra granted full membership. ↑ "CERN.ch". Public.web.cern.ch. Retrieved 20 November 2010. ↑ "Professor Sijbrand de Jong elected as next President of CERN Council". CERN press office. CERN. Retrieved 18 January 2016. ↑ "Member States". International relations. CERN. Retrieved 25 November 2015. This page wis last eeditit on 8 Mairch 2019, at 21:33.